Anabaptists constituted one of the most persecuted and most mobile religious populations of the Reformation and Confessional Ages. 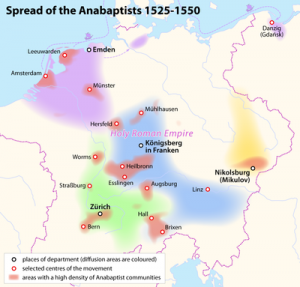 Lacking a durable alliance with the state anywhere in Europe, Anabaptists constituted one of the most persecuted and most mobile religious populations of the Reformation and Confessional Ages. A single, clearly defined magisterial office was also absent from the movement, and the Anabaptists’ migratory experience encouraged regional variations in the movement that built on its distinct starting points and traditions. At the same time, interactions between different Anabaptist groups undermined those regional differences. The result was the formation of distinct yet inter-related traditions that survived the Confessional Age: Mennonites, Swiss Brethren, Amish, and Hutterites. According to The Chronicle of the Hutterian Brethren, on the evening of 21 January 1525 a group of former adherents of the reforming movement led by Huldrych Zwingli (1484–1531) in Zurich gathered in the house of the mother of Felix Manz (ca. 1498–1527). 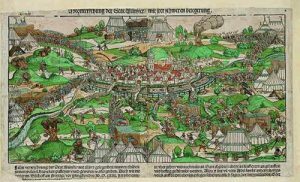 As the Swiss Anabaptists moved beyond the borders of the Confederation, they encountered a distinct Anabaptist tradition rooted in the mystically inspired theology of the Saxon Reformers Andreas Bodenstein von Karlstadt (1480–1541) and Thomas Müntzer (1489–1525). These Anabaptists also criticized infant baptism, but for different reasons than the Swiss. While the Biblicism of the Swiss pushed them to restore what they perceived to be the true ceremonies of the ancient church, south German Anabaptists sought to purge the church of empty and meaningless rites that paid no attention to the commitment of the believer. 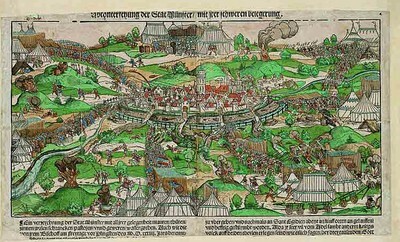 Periods of intense persecution from 1535 to 1537 and again between 1547 and 1552 had a profound effect on the Anabaptist communities in Moravia. The Philippites and Gabrielites for the most part returned to their home territories, where many Philippites eventually joined the Swiss Brethren and the Gabrielites were increasingly drawn to Spiritualism.20 The Austerlitz Brethren and the Hutterites were able to weather the storm in Moravia, but adopted very different strategies to do so. The former gave up the communitarian ideals so characteristic of Moravian Anabaptism, thereby allowing them to blend in with local populations and to survive into the 17th century.21 The Hutterites rode out the periods of persecution by breaking up into smaller groups and dispersing throughout lower Austria, southern Moravia, and Slovakia. When the danger had passed, they returned to their communal lives.22 In the second half of the 16th century they entered into their “golden years”, when the strict organization of their communitarian settlements (Haushaben or Brüderhöfe) and efficiencies of communal living created an economic success story that likely drew further converts from the Empire for economic as much as religious reasons. The number of Haushaben, estimated at 36 not long after the mid-century persecutions, grew to as many as 74 settlements by the end of the 16th and beginning of the 17th centuries. These units may have housed between 20,000 and 25,000 people.23 Much of this growth came from continued vigorous missionary activity in southern Germany and Austria, as well as Venetian territories in northern Italy. This activity led regularly to clashes with the Swiss Brethren, as the Hutterites now called Anabaptist congregations deriving from the Swiss tradition. The security and prosperity of the brethren in the later 16th century was, however, short lived. 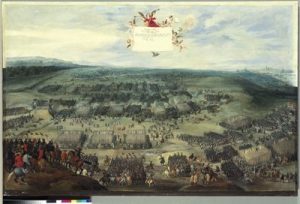 In the early years of the 17th century, the Haushaben along the Moravian-Hungarian border were ravaged during incursions by Turkish troops. More serious damage came with the outbreak of the Thirty Years’ War, especially after the Habsburg victory at the Battle of White Mountain (1620) near Prague, which put an end to religious pluralism in the region. Two years later the final expulsion of the Hutterites was ordered and their property seized. Some of the Hutterites converted to Catholicism, the remainder of about 10,000 people crossed into Hungary where they had already established satellite communities in the middle of the preceding century. There, with a new administrative center in Sabatisch (Sobotište), they witnessed a modest revival, especially under the leadership of the elder Andreas Ehrenpreis (1589–1662). However, in the second half of the 17th century, the communities went into rapid economic and demographic decline. One of the reasons for this may be a reduction in the numbers of refugees from the traditional missionary fields in the German-speaking lands. In the later 18th century, the final remnants of a few hundred people in Habsburg lands were forced to embrace Catholicism under the “Enlightened” policies of Maria Theresa (1717–1780) and Joseph II. (1741–1790).24 However, that was not the end of the Hutterite story. In the middle of the 18th century Lutheran migrants from Carinthia encountered the remnants of the Hutterite community in Transylvania. Impressed by the organization of the Hutterites, the Lutherans joined and reinvigorated the community. Under the threat of continued persecution, descendants of this group migrated first to Ukraine and Russia, and ultimately to the United States and Canada. Among the radicals flocking to Strasbourg at the end of the 1520s was Melchior Hoffman (ca. 1490–ca. 1543), a furrier and lay preacher active in the north, who had run afoul of the Lutheran authorities and clergy. Initially well received by the Strasbourg Reformers, he soon had conflicts with them as well. In 1530 he visited Emden and East Frisia, where he baptized numerous converts. Among them were individuals who were later to play important roles in the movement, especially Jan Mathys van Haarlem (died 1534) and David Joris (ca. 1501–1556). However, in 1531 after the execution of several of his followers, Hoffman suspended baptizing. 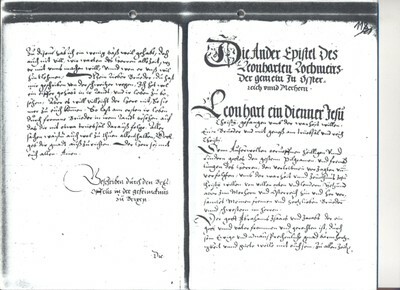 [LEFT]: Letter of Leonhard Lochmaier to the Parish in Austria and Moravia, 1538; source: Archives of the Mennonite Church, Goshen, IN., Codex Hab 17, Reel 81 VW. 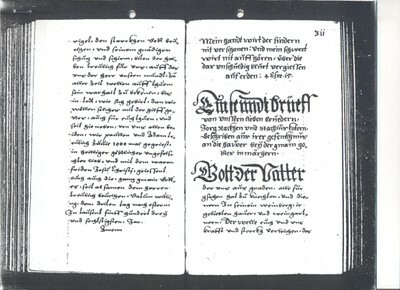 [RIGHT]: Letter of Jörg Rack to the Parish in Moravia, 1561; source: Archives of the Mennonite Church, Goshen, IN., Codex III, Reel 1 VW. Clearly, the experiences of a migratory existence, frequently as refugees, highlighted and even exacerbated differences between Anabaptist traditions and groups. Yet, especially in the 17th century and after, there were moves toward greater unity and uniformity between those groups and traditions, facilitated by the sharing of ideas and practices. Obviously, face-to-face encounters, either formal meetings aimed at the unification of groups or encounters between missionaries of competing traditions, played an important role. However, limited surviving evidence of such encounters suggests that they did more to harden differences between the various groups than to encourage unity. Rather, it appears that the written word, either in printed form or in the manuscript collections characteristic of the Hutterite tradition, was a much more effective means of transmission.56 This is most obvious in a number of high profile cases of borrowing, or even plagiarizing, major treatises, biblical concordances, and congregational orders from other traditions.57 However, some of the most common means of transmission were likely collections of martyr stories and hymns. 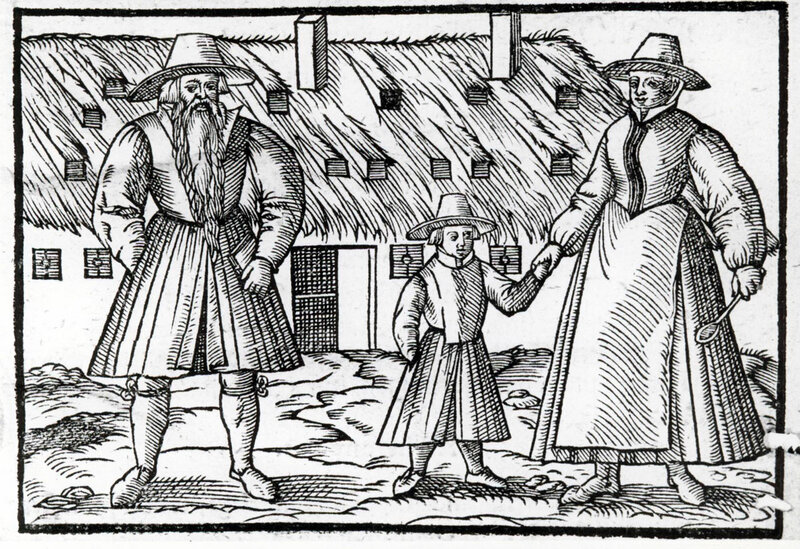 As they moved across northern Europe, Anabaptist refugees were subjected to pressures that encouraged both assimilation with and differentiation from the surrounding society and other Anabaptists. Without a single dominant theological teacher or office, and with only limited ties to secular authority, they had no clearly defined orthodoxy or orthopraxis. Different Anabaptist groups did, however, share some basic assumptions about central teachings of the movement: that baptism should be administered to adults on the basis of a confession of faith, that the church was a voluntary association in some way separated from the world, that the leadership was non-sacerdotal and drawn from the community, and that members of the community were responsible for each other’s wellbeing through some sort of mutual sharing. The details of these teachings, and how they were to be implemented in the life of the community, varied between regions where the Anabaptist movement began. More variations developed as a result of the Anabaptists’ refugee experiences. Often these experiences encouraged conflict and further distinctions within the movement, as with the Hutterites and other Moravian Anabaptists, the Mennonites and the Doopsgezinden, the Amish and the Swiss Brethren. Throughout this process, though, the shared core of teachings persisted and encouraged attempts at unification, resulting in a shared perception of a common heritage. Contemporaries often applied the label “Anabaptist” to religious dissenters in general. In the 19th and 20th centuries, free-church historians, who identified the 16th-century Anabaptists as their own spiritual ancestors, narrowed the focus to “Evangelical Anabaptists”, associated especially with the movement stemming from Zurich and later that in the Netherlands and northern Germany identified with Menno Simons. The classic statement of this position is Bender, The Anabaptist Vision 1944. The scope of the definition was again widened and the multiple origins of the movement stressed in Stayer / Packull / Deppermann, From Monogenesis 1975. More recent scholarship has emphasized the developing theological unity between the different Anabaptist traditions, see Snyder, Anabaptist History 1995, pp. 83–98; idem, Beyond Polygenesis 1994. Bebbington, Baptists 2010, p. 25 calls the question of the relationship between continental Anabaptists and English Baptists “the most developed historiographical controversy concerning the Baptists”. In fact, this question has dogged the movement since the formation of the first Baptist congregation. The earliest Baptists usually disavowed any connection to Anabaptism. Serious suggestions of any association first appeared in the 18th century, and grew significantly in the 19th when enlisted in support of claims that an unbroken succession of believer’s baptism had existed in Christianity since the time of the apostolic church, see Kliever, General Baptist Origins 1962, pp. 291–292. The most ambitious thesis about the influence of Anabaptism on not only the English Baptist movement but also on the English separatist tradition in general is Horst, The Radical Brethren 1972. However, as critics of this thesis (e.g. White, The English Separatist Tradition 1971, pp. 161–164; Bebbington, Baptists 2010, pp. 29–30) have observed, the English “anabaptists” shared few characteristics with continental Anabaptists, and even believer’s baptism was not among them. A stronger case can be made for Anabaptist influence specifically on the formation of the General Baptists, a branch of the English Baptist tradition founded in an exile church in Amsterdam in 1608 or 1609 by John Smyth (ca. 1554–1612) and Thomas Helwys (ca. 1550–1616). Theologically the General Baptists were much closer to continental Anabaptists than were the more Calvinist Particular Baptists, and part of the first General Baptist congregation eventually joined the Doopsgezinden. However, the remainder of the congregation, which returned to England and laid the foundations for subsequent General Baptist history, may have broken with their fellows over the decision to join the Doopsgezinden. See Underwood, A History 1947, pp. 52–53; Kliever, General Baptist Origins 1962, pp. 303–315; Brachlow, The Community 1988, p. 156; Coggins, John Smyth’s Congregation 1991, pp. 61–114; Cross, The Adoption 2010, pp. 14–15. In some ways more spectacular is the story of Mennonite and Hutterite migrations to Russia beginning in the 18th century and ultimately to the United States, Canada, and Latin America in the 19th and 20th centuries. However, by that time many of the distinctive teachings and practices of the different Anabaptist groups had already been established as a result of migrations within Europe. Hutterian Brethren, The Chronicle 1987, vol. 1, p. 45. Blanke, Brothers in Christ 1961, p. 20. Harder, The Sources 1985, pp. 336–338. Snyder, The Birth 2006, pp. 538–581; Stayer, Die Anfänge 1975; Haas, Der Weg 1975; Hui, Vom Bauernaufstand 1989. Snyder, The Birth 2006, pp. 554–564. Snyder, The Birth 2006, pp. 595–616. For an overview of the influence of Sattler’s Schleitheim Articles on subsequent Anabaptism, see idem, The Influence 1989. On Hans Hut see Seebaß, Müntzers Erbe 2002. Bauman, The Spiritual Legacy 1991, p. 257. Stayer, The German Peasants’ War 1991, pp. 153–154. The best treatment of the roots of south German and Austrian Anabaptism and the roles of Hut and Denck in its origins remains Packull, Mysticism 1977. See also Dipple, The Spiritualist Anabaptists 2007. Deppermann, Melchior Hoffman 1987, pp. 162–203 remains one of the best summaries of religious developments in Strasbourg during this period. See also Stayer, Swiss-South German Anabaptism 2007, pp. 99–107; Dipple, The Spiritualist Anabaptists 2007, pp. 266–279; and Seebaß, Müntzers Erbe 2002. On the conflict between Hubmaier and Hut, see Packull, Mysticism 1977, pp. 99–106. Rothkegel, Anabaptist Sabbatarianism 2013, pp. 519–573. Marpeck has been the object of increasing interest in recent years. Among the best introductions to his life and thought are Klassen, Covenant 1968; Boyd, Pilgram Marpeck 1992; and Klaassen / Klassen, Marpeck 2008. Packull, Hutterite Beginnings 1995, pp. 214–235. Rothkegel, Anabaptism 2007, pp. 185–189. On the Hutterites see Chudaska, Peter Riedemann 2003; Schlachta, Hutterische Konfession 2003; idem, From the Tyrol 2008; Rauert, Katalog 2011. Rothkegel, Anabaptism 2007, pp. 199–200. ibidem, pp. 207–210; Harrison, Andreas Ehrenpreis 1997. Revelation 21,2 describes the descent of a New Jerusalem which will serve as a haven during the tribulations of the apocalypse. Melchior Hoffman had earlier identified Strasbourg as the New Jerusalem. Stayer, The Radical Reformation 1995, pp. 273–274. Visser, Mennonites and Doopsgezinden 2007, pp. 299–343. The primary motivation of the early Swiss Anabaptists was to reinstate a fundamental practice of the New Testament church on the basis of the biblical record, see Harder, The Sources 1985, p. 335, pp. 427–428; Yoder, The Legacy 1973, p. 36; Pipkin, Balthasar Hubmaier 1989, pp. 95–149; Armour, Anabaptist Baptism 1966, pp. 19–57. By way of contrast Hans Hut and Melchior Hoffman both bequeathed to their followers an understanding of baptism including more mystical and eschatological themes, although both of these elements were later deemphasized, see Packull, Mysticism 1977, pp. 66–87; Deppermann, Melchior Hoffman 1987, pp. 229–240; Armour, Anabaptist Baptism 1966, pp. 58–112. 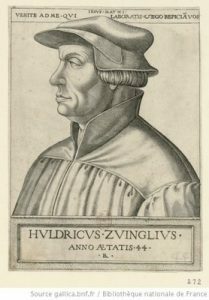 For the most recent statements in the debate about the ecclesiology of the first Swiss Anabaptists, see Snyder, The Birth 2006; Strübind, Eifriger als Zwingli 2003. Packull, Hutterite Beginnings 1995, pp. 61–66, 87–89, 122–123, 214–235. Yoder, The Legacy 1973, pp. 36–42. Snyder, The Birth 2006, pp. 520–581. Stayer, Anabaptists and the Sword 1976, pp. xxv–xxvii, 150–159, 213–223. Hutterian Brethren, The Chronicle 1987, vol. 1, pp. 47–50, 80. Stayer, The German Peasants’ War 1991, pp. 141–142. Klötzer, The Melchiorites 2007, p. 233. A clear statement of the radical separation adopted by the Hutterites is Peter Rideman’s Confession of Faith. See Stayer, Anabaptists and the Sword 1976, pp. 175–177; Rideman, Confession 1970, pp. 102–114, 131–136, 139–153, 205–223. Roth, Marpeck 2007, pp. 366–367. Van Braght, Martyrs Mirror 1950, p. 8; Zijlstra, Om de ware gemeente 2000, pp. 270–315; Visser, Mennonites and Doopsgezinden 2007, pp. 319–322. Roth, Letters of the Amish Division 1993, pp. 1–18. Oyer, The Anabaptists 2000, pp. 247–253. Stayer, The German Peasants’ War 1991, pp. 131, 146–147; Packull, Hutterite Beginnings 1995, p. 294. Rempel, Jörg Maler’s Kunstbuch 2010, p. 191; Gross, The Golden Years 1980, pp. 172–173. Harder, The Sources 1985, p. 345. Yoder, The Legacy 1973, pp. 44–45; Packull, Hutterite Beginnings 1995, pp. 33–53. Stayer, The German Peasants’ War 1991, pp. 144–146. Roth, Marpeck 2007, p. 365. Packull, Hutterite Beginnings 1995, pp. 283–302. Rothkegel, Anabaptism 2007, pp. 208–209; Harrison, Andreas Ehrenpreis 1997. In addition to caring for the less fortunate in their own communities, they often reached beyond their own borders. Probably best known is their financial and political support for embattled Swiss Brethren in the 17th century, although they also provided support to the Hutterites and to non-Anabaptist persecuted minorities. See Bangs, Letters on Toleration 2004; Wälchli, Täufer 2010. For details of the Hutterite book culture, see Rothkegel, Anabaptism 2007, pp. 204–205. For example, Pilgram Marpeck’s Admonition of 1542 (Marpeck, Vermanung 1542) includes a careful reworking of Bernhard Rothmann’s Confession of Two Sacraments(Rothmann, Bekentnisse 1533, http://resolver.staatsbibliothek-berlin.de/SBB0000ACDC00000000), see Wray, The “Vermahnung” 1956. 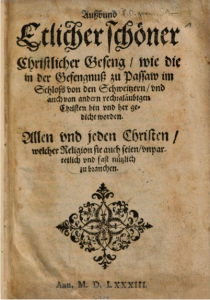 In a similar vein, by 1575 Menno Simons’ Foundation Book (Simons, Ein Fundament 1794, http://resolver.sub.uni-goettingen.de/purl?PPN240643674) had been translated into German and was widely circulated among the Swiss Brethren, see Roth, Marpeck 2007, p. 369. 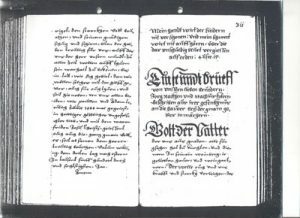 The first church order of the Hutterites was likely an expanded version of the earliest known Swiss congregational order, see Packull, Hutterite Beginnings 1995, pp. 33–53. Gregory, Anabaptist Martyrdom 2007, pp. 496–499. A number of the Dutch Mennonite martyr accounts appear in Golden Apples in Silver Bowls, a published Swiss Brethren collection of documents and treatises that contain martyrological material, see Rempel, Anabaptist Religious Literature 2007, p. 415; Gross, Golden Apples 1999. The Chronicle of the Hutterian Brethren also includes a significant number of martyr accounts, although these are largely about members of the community or south German Anabaptists that the Hutterites regarded as their own forebears, see Hutterian Brethren, The Chronicle 1987–1998. Roth, Marpeck 2007, pp. 370–371; Rempel, Anabaptist Religious Literature 2007, p. 402; Rothkegel, Anabaptism 2007, p. 206. On the importance of hymns in encouraging perseverance in the face of persecution, see Gregory, Anabaptist Martyrdom 2007, pp. 474–475. [Anonymus]: Ausbund etlicher schöner Christlicher Geseng, wie die in der Gefengnuß zu Passaw im Schloss von den Schweitzern, und auch von andern rechtgläubigen Christen hin und her gedicht worden, s.l. 1583; online: http://www.mdz-nbn-resolving.de/urn/resolver.pl?urn=urn:nbn:de:bvb:12-bsb10207712-6 [24.10.2014]. Bangs, Jeremy Dupertuis (ed. ): Letters on Toleration: Dutch Aid to Persecuted Swiss and Palatine Mennonites 1615–1699, Rockport, MA 2004. Bossert, Gustav (ed. ): Quellen zur Geschichte der Wiedertäufer, Leipzig 1930, vol. 1 (Quellen und Forschungen zur Reformationsgeschichte 13). Braght, Thielemann J. van: Het bloedig tooneel, of Martelaers Spiegel der Doops-Gesinde of Weereloose Christenen, die, om ‘t getuygenis van Jesus haren Salighmaker, geleden hebben, ende gedood zĳn, van Christi tĳd af, tot desen tĳd toe: Versamelt uyt verscheyde geloofweerdige Chronĳken, Memorien, en Getuygenissen, 2nd ed., Amsterdam 1685; online: https://disc.leidenuniv.nl/webclient/DeliveryManager?custom_att_2=simple_viewer&pid=2952159 [24/10/2014]. idem: The Bloody Theater or Martyrs Mirror of the Defenseless Christians: Who Baptized Only Upon Confession of Faith, and Who Suffered and Died for the Testimony of Jesus, Their Savior, From the Time of Christ to the Year A.D. 1660, 5th ed., Scottdale, PA 1950. Braght, Thielemann J. van: The Bloody Theater or Martyrs Mirror of the Defenseless Christians: Who Baptized Only Upon Confession of Faith, and Who Suffered and Died for the Testimony of Jesus, Their Savior, From the Time of Christ to the Year A.D. 1660, 3rd ed., Elkhart, IN 1886; online: http://archive.org/details/MartyrsMirror [17/10/2014]. Gross, Leonard (ed. ): Golden Apples in Silver Bowls: The Rediscovery of Redeeming Love, Lancaster, PA 1999 (Mennonite Sources and Documents 6). Hutterian Brethren (ed. ): The Chronicle of the Hutterian Brethren, Rifton, NY et al. 1987–1998, vol. 1–2. Klassen, William et al. (ed. ): The Writings of Pilgram Marpeck, Kitchener, ON 1978 (Classics of the Radical Reformation 2). Lowry, James W. et al. (ed. ): Documents of Brotherly Love: Dutch Mennonite Aid to Swiss Anabaptists, Millersburg, OH 2007, vol. 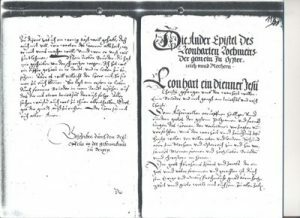 1: 1635–1709 (Dutch Mennonite–Swiss Anabaptist Document Series 2). Marpeck, Pilgram: Vermanung, auch gantz klarer, gründtlicher und unwidersprechlicher Bericht zu warer christlicher, ewigbestendiger Pundtßuereynigung: Mit grund heyliger Schrifft, durch Bewerung warer Tauff und Abentmals Christi, s.l. 1542. Pipkin, H. Wayne et al. (ed. ): Balthasar Hubmaier: Theologian of Anabaptism, Scottdale, PA 1989 (Classics of the Radical Reformation 5). Rauert, Matthias H. et al (ed. ): Katalog der hutterischen Handschriften und der Drucke aus hutterischem Besitz in Europa, Gütersloh 2011, vol. 1–2 (Quellen und Forschungen zur Reformationsgeschichte, Quellen zur Geschichte der Täufer 18). Rempel, John D. (ed. ): Jörg Maler’s Kunstbuch: Writings of the Pilgram Marpeck Circle, Kitchener, ON 2010 (Classics of the Radical Reformation 12). Rideman, Peter: Confession of Faith, 2nd ed., Rifton, NY 1970. Roth, John D. (ed. ): Letters of the Amish Division: A Sourcebook, Goshen, IN 1993. Rothmann, Bernhard: Bekentnisse van beydem Sacramenten Doepe unde Nachmaele der predicanten tho Munster …, Münster 1533; online: http://resolver.staatsbibliothek-berlin.de/SBB0000ACDC00000000 [29/10/2014]. 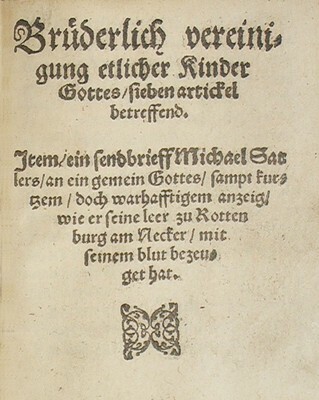 Sattler, Michael: Brüderliche Vereinigung etzlicher Kinder Gottes siben Artickel betreffend, Worms 1527; online: http://nbn-resolving.de/urn%3Anbn%3Ade%3Abvb%3A12-bsb00027178-4[23/09/2014]. Schornbaum, Karl (ed. ): Quellen zur Geschichte der Wiedertäufer, Leipzig 1934, vol. 2 (Quellen und Forschungen zur Reformationsgeschichte 16). Simons, Menno: Ein Fundament und Klare Anweisung von der seligmachenden Lehre unsers Herrn Jesu Christi: Aus Gottes Wort kurz begriffen, Lancaster, PA 1794; online: http://resolver.sub.uni-goettingen.de/purl?PPN240643674 [29/10/2014]. Snyder, Clifford Arnold (ed. ): Biblical Concordance of the Swiss Brethren 1540, Kitchener, ON 2001 (Anabaptist Texts in Translation 2). Verein für Reformationsgeschichte (ed. ): Quellen zur Geschichte der Täufer (QGT), Gütersloh 1938–2011, vol. 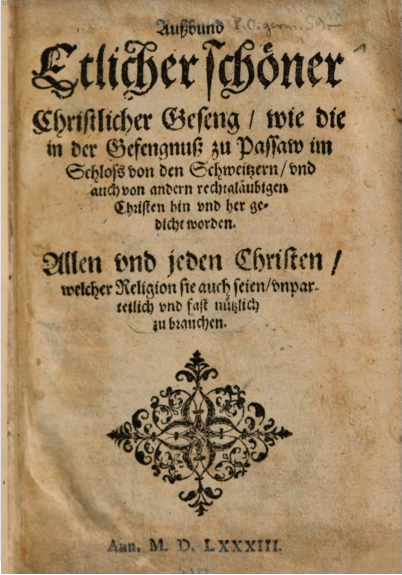 3–18 (Quellen und Forschungen zur Reformationsgeschichte). Wälchli, Philipp et al. (ed. ): Täufer und Reformierte im Disput: Texte des 17. Jahrhunderts über Verfolgung und Toleranz aus Zürich und Amsterdam, Zug 2010. Yoder, John Howard (ed. ): The Legacy of Michael Sattler, Scottdale, PA 1973 (Classics of the Radical Reformation 1). Armour, Rollin Stely: Anabaptist Baptism: A Representative Study, Scottdale, PA 1966 (Studies in Anabaptist and Mennonite History 11). Bauman, Clarence: The Spiritual Legacy of Hans Denck: Interpretation and Translation of Key Texts, Leiden et al. 1991 (Studies in Medieval and Reformation Thought 47). Bebbington, David W.: Baptists through the Centuries: A History of a Global People, Waco, TX 2010. Bender, Harold S.: The Anabaptist Vision, in: The Mennonite Quarterly Review 18 (1944), pp. 67–88. Bergsten, Torsten: Balthasar Hubmaier: Anabaptist Theologian and Martyr, Valley Forge, PA 1978.
idem: Balthasar Hubmaier: Seine Stellung zu Reformation und Täufertum (1521–1528), Kassel 1961. Blanke, Fritz: Brothers in Christ: The History of the Oldest Anabaptist Congregation Zollikon, near Zurich, Switzerland, Scottdale, PA 1961. Boyd, Stephen B.: Pilgram Marpeck: His Life and Social Theology, Durham, NC 1992 (Duke Monographs in Medieval and Renaissance Studies 12). Brachlow, Stephen: The Communion of Saints: Radical Puritan and Separatist Ecclesiology 1570–1625, Oxford et al. 1988 (Oxford Theological Monographs). Chudaska, Andrea: Peter Riedemann: Konfessionsbildendes Täufertum im 16. Jahrhundert, Gütersloh 2003 (Quellen und Forschungen zur Reformationsgeschichte 76). Coggins, James Robert: John Smyth’s Congregation: English Separatism, Mennonite Influence, and the Elect Nation, Waterloo, ON et al. 1991 (Studies in Anabaptist and Mennonite History 32). Cross, Anthony R.: The Adoption of Believer’s Baptism and Baptist Beginnings, in: idem et al. (ed. ): Exploring Baptist Origins, Oxford 2010 (Centre for Baptist History and Heritage Studies 1), pp. 1–32. Deppermann, Klaus: Melchior Hoffman: Social Unrest and Apocalyptic Visions in the Age of Reformation, Edinburgh 1987.
idem: Melchior Hoffman: Soziale Unruhen und apokalyptische Visionen im Zeitalter der Reformation, Göttingen 1979. Dipple, Geoffrey: The Spiritualist Anabaptists, in: John D. Roth et al. (ed. ): A Companion to Anabaptism and Spiritualism 1521–1700, Leiden et al. 2007 (Brill’s Companions to the Christian Tradition 6), pp. 257–294. Goertz, Hans-Jürgen (ed. ): Umstrittenes Täufertum, 1525–1975: Neue Forschungen, Göttingen 1975. Gregory, Brad S.: Anabaptist Martyrdom: Imperatives, Experience, and Memorialization, in: John D. Roth et al. (ed. ): A Companion to Anabaptism and Spiritualism 1521–1700, Leiden et al. 2007 (Brill’s Companions to the Christian Tradition 6), pp. 467–502. 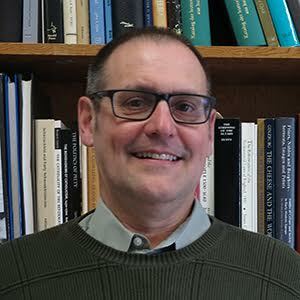 Gross, Leonard: The Golden Years of the Hutterites: The Witness and Thought of the Communal Moravian Anabaptists During the Walpot Era 1565–1578, Scottdale, PA et al. 1980 (Studies in Anabaptist and Mennonite History 23). Haas, Martin: Der Weg der Täufer in die Absonderung, in: Hans-Jürgen Goertz (ed. ): Umstrittenes Täufertum 1525–1975: Neue Forschungen, Göttingen 1975, pp. 50–78. Harrison, Wes: Andreas Ehrenpreis and Hutterite Faith and Practice, Kitchener, ON et al. 1997 (Studies in Anabaptist and Mennonite History 36). Horst, Irvin Buckwalter: The Radical Brethren: Anabaptism and the English Reformation to 1558, Nieuwkoop 1972. Hui, Matthias: Von Bauernaufstand zur Täuferbewegung: Entwicklungen in der ländlichen Reformation am Beispiel des zürcherischen Grüninger Amtes, in: Mennonitische Geschichtsblätter 46 (1989), pp. 113–144. Jecker, Hanspeter: Ketzer – Rebellen – Heilige: Das Basler Täufertum von 1580–1700, Liestal 1998. Klassen, William: Covenant and Community: The Life, Writings, and Hermeneutics of Pilgram Marpeck, Grand Rapids, MI 1968. Klaassen, Walter / Klassen, William: Marpeck: A Life of Dissent and Conformity, Waterloo, ON et al. 2008 (Studies in Anabaptist and Mennonite History 44). Kliever, Lonnie D.: General Baptist Origins: The Question of Anabaptist Influence, in: The Mennonite Quarterly Review 36 (1962), pp. 291–321. Klötzer, Ralf: The Melchiorites and Münster, in: John D. Roth et al. (ed. ): A Companion to Anabaptism and Spiritualism 1521–1700, Leiden et al. 2007 (Brill’s Companions to the Christian Tradition 6), pp. 217–254. Koop, Karl: Anabaptist-Mennonite Confessions of Faith: The Development of a Tradition, Kitchener, ON 2004 (Anabaptist and Mennonite Studies 3). Leu, Urs B. et al. (ed. ): Die Zürcher Täufer 1525–1700, Zurich 2007. Oyer, John S.: The Anabaptists in Esslingen, in: John D. Roth (ed. ): “They Harry the Good People Out of the Land”: Essays on the Persecution, Survival and Flourishing of Anabaptists and Mennonites, Goshen, IN 2000, pp. 191–321. Packull, Werner O.: Hutterite Beginnings: Communitarian Experiments during the Reformation, Baltimore, MD et al. 1995.
idem: Mysticism and the Early South German-Austrian Anabaptist Movement 1525–1531, Scottdale, PA et al. 1977. Rempel, John D.: Anabaptist Religious Literature and Hymnody, in: John D. Roth et al. (ed. ): A Companion to Anabaptism and Spiritualism 1521–1700, Leiden et al. 2007 (Brill’s Companions to the Christian Tradition 6), pp. 389–422. Roth, John D. et al. (ed. ): A Companion to Anabaptism and Spiritualism 1521–1700, Leiden et al. 2007 (Brill’s Companions to the Christian Tradition 6). idem: Marpeck and the Later Swiss Brethren 1540–1700, in: idem et al. (ed. ): A Companion to Anabaptism and Spiritualism 1521–1700, Leiden et al. 2007 (Brill’s Companions to the Christian Tradition 6), pp. 347–386. Rothkegel, Martin: Anabaptism in Moravia and Silesia, in: John D. Roth et al. (ed. ): A Companion to Anabaptism and Spiritualism 1521–1700, Leiden et al. 2007 (Brill’s Companions to the Christian Tradition 6), pp. 163–210. idem: Anabaptist Sabbatarianism in Sixteenth-Century Moravia, in: The Mennonite Quarterly Review 87 (2013), pp. 519–573. Schlachta, Astrid von: Die Hutterer zwischen Tirol und Amerika: Eine Reise durch die Jahrhunderte, Innsbruck 2006.
idem: Hutterische Konfession und Tradition (1578–1619): Etabliertes Leben zwischen Ordnung und Ambivalenz, Mainz 2003 (Veröffentlichungen des Instituts für Europäische Geschichte 198). idem: From the Tyrol to North America: The Hutterite Story Through the Centuries, Kitchener, ON 2008. Schubert, Anselm et al. (ed. ): Grenzen des Täufertums/Boundaries of Anabaptism Neue Forschungen. Beiträge der Konferenz in Göttingen vom 23.-27.08.2006, Gütersloh 2009 (Schriften des Vereins für Reformationsgeschichte 209). Seebaß, Gottfried: Müntzers Erbe: Werk, Leben und Theologie des Hans Hut, Gütersloh 2002 (Quellen und Forschungen zur Reformationsgeschichte 73). Snyder, Clifford Arnold: Anabaptist History and Theology: An Introduction, Kitchener, ON 1995.
idem: The Birth and Evolution of Swiss Anabaptism 1520–1530, in: The Mennonite Quarterly Review 80 (2006), pp. 501–645. idem: The Influence of the Schleitheim Articles on the Anabaptist Movement: An Historical Evaluation, in: The Mennonite Quarterly Review 63 (1989), pp. 323–344. idem: Beyond Polygenesis: Recovering the Unity and Diversity of Anabaptist Theology: in H. Wayne Pipkin (ed. ): Essays in Anabaptist Theology, Elkhart, IN 1994, pp. 1–33. 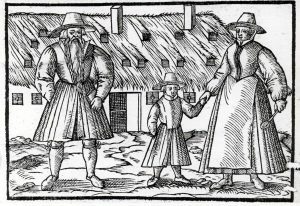 Sprunger, Keith L.: English Puritans and Anabaptists in Early Seventeenth-Century Amsterdam, in: The Mennonite Quarterly Review 46 (1972), pp. 113–128. Stayer, James M.: Anabaptists and the Sword, 2nd ed., Lawrence, KS 1976.
idem: Die Anfänge des schweizerischen Täufertums im reformierten Kongregationalismus, in: Hans-Jürgen Goertz (ed. ): Umstrittenes Täufertum 1525–1975: Neue Forschungen, Göttingen 1975, pp. 19–49. idem: The German Peasants’ War and Anabaptist Community of Goods, Montreal et al. 1991 (McGill-Queen’s Studies in the History of Religion 6). idem: The Radical Reformation, in: Thomas A. Brady Jr. et al. (ed. ): Handbook of European History 1400–1600: Late Middle Ages, Renaissance and Reformation, Leiden 1995, vol. 2: Visions, Programs, and Outcomes, pp. 249–276. idem: Swiss-South German Anabaptism 1526–1540, in: John D. Roth et al. (ed. ): A Companion to Anabaptism and Spiritualism 1521–1700, Leiden et al. 2007 (Brill’s Companions to the Christian Tradition 6), pp. 83–115. idem: Vielweiberei als “innerweltliche Askese”: Neue Eheauffassungen in der Reformationszeit, in: Mennonitische Geschichtsblätter 32 (1980), pp. 24–41. Stayer, James M. / Packull, Werner O. / Deppermann, Klaus: From Monogenesis to Polygenesis: The Historical Discussion of Anabaptist Origins, in: The Mennonite Quarterly Review 49 (1975), pp. 83–121. Strübind, Andrea: Eifriger als Zwingli: Die frühe Täuferbewegung in der Schweiz, Berlin 2003. Underwood, Alfred Clair: A History of the English Baptists, London 1947. Visser, Piet: Mennonites and Doopsgezinden in the Netherlands 1535–1700, in: John D. Roth et al. (ed. ): A Companion to Anabaptism and Spiritualism 1521–1700, Leiden et al. 2007 (Brill’s Companions to the Christian Tradition 6), pp. 299–343. Vogler, Günter: Die Täuferherrschaft in Münster und die Reichsstände: Die politische, religiöse und militärische Dimension eines Konflikts in den Jahren 1534 bis 1536, Gütersloh 2014 (Quellen und Forschungen zur Reformationsgeschichte 88). Waite, Gary K.: David Joris and Dutch Anabaptism 1524–1543, Waterloo, ON 1990. White, Barrington Raymond: The English Separatist Tradition: From the Marian Martyrs to the Pilgrim Fathers, London et al. 1971 (Oxford Theological Monographs). Wray, Frank J.: The “Vermahnung” of 1542 and Rothmann’s “Bekenntnisse”, in: Archiv für Reformationsgeschichte 47, 1 (1956), pp. 243–251. Zijlstra, Samme: Om de ware gemeente en de oude gronden: Geschiedenis van de dopersen in de Nederlanden 1531–1675, Hilversum et al. 2000. This entry was posted in Early Modern, History, Immigration, Migration, Religion. Bookmark the permalink.